Follow these instructions to make a creepy, crawly spider that can wiggle and twist about with a few movements of the wrist. 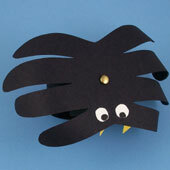 Traced fingers are the basis for this animated spider toy, and a paper fastener allows it to swivel around. This is a fun and easy Halloween project that is especially good for mixed-age groups of children. The older children can help the younger ones make the creepy-crawly spiders, and everyone will have fun playing with them. Read through the project and gather the materials needed for creating the spider bracelets. If you are doing this craft with a group, pre-cutting the black construction paper will make the craft go faster. Cut the black construction paper in half (or quarters) to create 6" by 9" rectangles. Cut a 1" strip off the longer edge to use as the bracelet. Tip: If your group includes children with larger hands, or adults, be sure to have some 9" by 12" sheets of paper available for them to use. Fold the black construction paper in half. Lay the child's hand, palm down, across the folded edge about midway through the palm. Trace around the fingers with white crayon. Cut on the traced outline and unfold to reveal a complete set of eight spider legs. Turn the spider legs over and, with the pencil, roll the legs around the pencil. This makes the legs curl under and gives a more creepy, crawly effect. Take the 1"-wide strip and form it into a ring that fits the child's wrist. Be sure that the ring can easily slip over the child's hand. Tape or staple the ends together to complete the bracelet. Center the bracelet on the underside of the spider legs and join them using the paper fastener. Push the paper fastener through the top of the spider legs into the bracelet, then spread the fastener tabs. Cut or punch two ½" (1 cm) circles from white paper or cardstock for the eyes, then draw pupils using the black marker. Cut two fangs from yellow paper or cardstock, being sure to add paper extra at the top for a glue tab. Glue the eyes to the top of the spider near the front edge. Fold the glue tab back on the fangs, then glue the tab to the underside of the front edge so that the fangs hang down. Tip: Use wiggly eyes in place of cutout eyes. They are easier for younger children than cutting out circles. 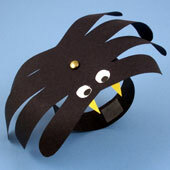 Make the spider go: Put fingers or wrist through the bracelet and rock the spider back and forth, creep and crawl around. The paper fastener allows the spider to twist about, too! Your spider is done! Who will you scare? Thanks to Deana M. for sharing this project idea with Aunt Annie's Craft Exchange in 1997. Deanna commented, "This is a fun and easy Halloween project that I did with a small group of two- to five-year-olds. They love tracing their hands and fingers whenever they are playing with crayons or markers, so this is simply a "twist" on an old favorite. We also talked about the number 8 that day, so on the backside of the spiders' legs, I wrote the numbers 1-8 in white crayon while each child counted with me." "This project took only a short while to complete, but the kids played for hours with their spiders, 'letting their fingers do the walking,' and were proud to show them off later. " 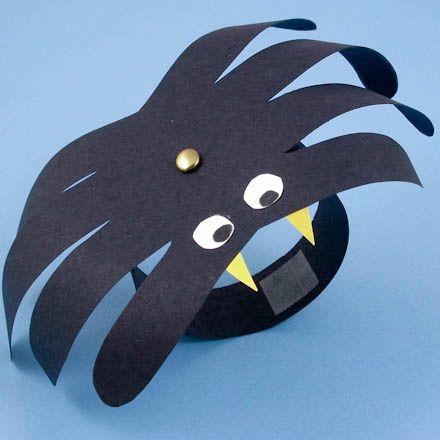 Tip: Cut the fangs so that they have extra paper at the top for gluing to the underside of the spider. Fold the fangs before or after gluing to make their pointy tips hang down.